Soak the daal overnight, and grind it fine. Beat it until foamy and light. Add chopped onion, green chilies, garam masal, ginger and salt. Mix well and allow it to stand for ten minutes. Spread a piece of wet muslin over a bowl and make vada over it. Put them in slated hot water. Squeeze out the water and keep them ready. Beat the curd till smooth. Add Salt and pepper to it. 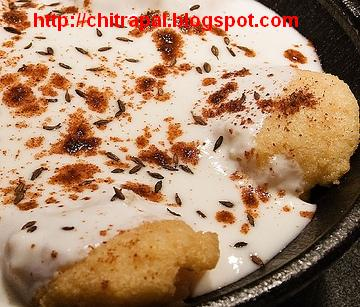 Soak vadas in curds and decorate according to taste. ye urad ki daal chilke waali honi chahiye ya bina chilke ki?